The upcoming summit between the U.S. and North Korea is a historical first. Learn more about how it came to be with this week’s CLP current event. “Dialogue brokered by Seoul has seen US-North Korea relations go from trading personal insults and threats of war last year to a summit between Kim and Trump due in Singapore on June 12. “In March, Mr Trump stunned the world by accepting an invitation to meet Mr Kim for an unprecedented sit-down. “North Korean leader Kim Jong Un met with Chinese President Xi Jinping in a northern Chinese port city and pledged his continuing commitment to denuclearization ahead of his expected summit with U.S. President Donald Trump, state media said Tuesday. 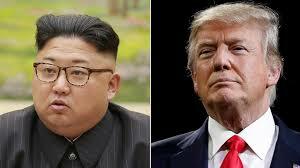 “North Korea regularly criticises the US – but there have been few attacks in recent weeks, amid plans for the summit. This latest statement is a reminder that discussions between the two countries will not be easy, says BBC Asia editor Michael Bristow. North Korea changes its time zone to match south, BBC News, May 5, 2018 “Until now, it was on Pyongyang Time, which is half an hour behind South Korea and Japan. “South Korean President Moon Jae-in will be making a visit to the White House later this month ahead of the historic summit between President Donald Trumpand North Korean leader Kim Jong Un. What is the history of U.S. North Korea relations? What does N Korea want from a summit? What does the U.S. want from a summit? To which branches does the U.S .Constitution assign treaty making? How might the recent summit between North and South Korea be a forecast for the U.S. North Korea Summit? Is unification of Korea possible? Does a summit include only the U.S. and North Korea? Which other countries need to support any decisions that are made? What is the role of South Korea in a U.S.- N Korea summit? What is the role of China? What is the role of Japan? What is the role of Russia? What additional topics might be discussed at the Summit? How significant are potential trade agreements? What is a hermit kingdom? How do past misunderstandings affect our ability to talk to North Korea? What are the dangers of a U.S.-North Korea summit? How much do the personalities of the two leaders matter? What does the North Korean decision to release of three U.S. prisoners mean? What does the choice of Singapore as the meeting location mean? Why Singapore? Are there conditions that North Korea must follow? What about the American captives? Does North Korea seem to want war with its neighbors and the United States? Is it possible something else is going on? What could be motivating North Korea’s behavior? CLP: How do other countries view the upcoming summit? Chronological listing of events leading up to the announcement of the summit. “Immediately after his father’s death, the younger Kim was hailed as “the great successor”. He was named head of the party, state and army within a fortnight of his father’s death. Since then, he has shown he is committed to the advancement of North Korea’s weapons programme, ordering four nuclear tests and several missile tests.